Soups are my favourite lunch because they are light but filling, and I don’t feel like all I want to do is lay down for the rest of the day after I eat. Also, I can make them from just about any vegetable combo I have in my precious fruit and veggie cart in the kitchen. Fennel soup is the one I made today and thought, Well, why don’t I just share this with you? So, here it is! Blend it either in a blender or with a stick mixer and season to taste. Let it rest for a couple of minutes and serve. Either serve it my favourite way, with a sprinkle of toasted seeds, croutons and fresh coriander or, my kids’ favourite way, with a dollop of creme fresh or sour cream. You can turn my favourite way into your favourite way by making your combination of seeds and herbs. I picked poppy, sesame, linseeds, pumpkin and sunflower because they are my favourite and I always have them ready. If there are some extra seeds, store them in a glass jar and use to sprinkle your breakfast cereal or a salad. Herb-wise, the same thing – make it your own. Instead of parsley or coriander, you can use dill, basil or chives, even tarragon. Careful with tarragon though, it’s quite intensive. Keep your hand steady as little goes a long way. You could eat the soup plain too, skipping all the extra bits and bobs. It’s delicious on its own. I just like to add to it for heartiness and nutrition. Pick your seeds, in a dry pan with them, heat them up to medium and toss them for a few minutes. At the first whiff of the spicy smoke, take them off the heat. They are ready. For extra crunchiness, you could leave them in the pan for another 30 seconds or so. Careful not to leave the seeds in the heat unattended cause they burn easily and more often than not go bitter. You’ll have to bin them and start from the beginning. This whole toasting venture takes about 5 minutes, and the flavour and aroma they give to the dishes are fantastic and so worth it! What’s your favourite soup? Or lunch? Please comment and share so we can inspire each other and exchange some recipes. If you liked this post, you might try my casserole recipe too. You could also share this recipe with your friends by clicking the buttons below to tweet it, facebook it, pin it or google + it (or more!). Your sharing will help me spread the word, build my blog and make my day. Cheers for your caring! 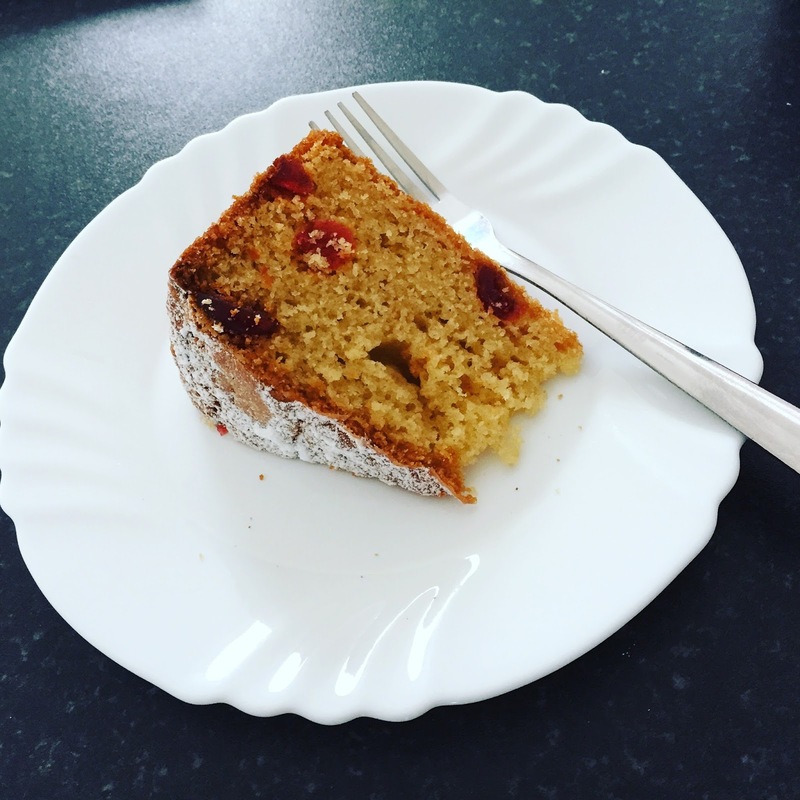 English Cherry Cake for the English St. George’s Day. Happy St. George’s day, England! Preheat oven at 160C/gas 3/320F. Cut the cherries into halves and coat them lightly in flour, so they don’t sink when you mix them in the batter. Lightly grease 8″ cake tin. Whisk butter and sugar in a large ball until creamy, then add eggs one by one and mix well. Once smooth, add the flour and baking powder and whisk until combined well. Then add cherries and mix some more. Once happy with how smooth and even it looks, pour the mixture into the greased cake tin and bake in the oven for 1 1/2 hours or until skewer or fork comes out clean. Take the cake out, when ready and leave it to cool for about 10 minutes and then transfer to a wire rack to cool completely. Serve with cream, clotted cream or vanilla ice-cream and enjoy just like we did today. Mix flour, baking powder, sugar and coconut together. Whisk milk, yoghurt, oil and vanilla paste (or seeds) together and add to dry ingredients. Pour the batter into well-greased and sprinkled with flour 9×13 baking pan and bake it in a preheated oven at 180C (350F) degrees for 25 – 30 minutes. and melt it on low to medium heat, stirring occasionally so it does not stick to the pan. You can keep them in a plastic container in the fridge for about 4-5 days, but if your house is anything like ours, the squares don’t stand a chance for more than a day :). One of my favourite dishes to make and to eat. Easy and delicious. Quick tip: for creamier mash, add a dollop of Crème fraîche. Preheat oven at 220C/425F/7 gas mark. Coat the meat in flour and leave on the side. Cut onions and garlic and place them in the casserole with 1 tablespoon of olive oil, butter and a pinch of sea salt on medium-high heat until soft, for about 5 minutes. Add celery, carrots and parsnips together with bay leaves until soft, for 10-15 minutes. Add the meat and sprigs of thyme, freshly ground black pepper. Add wine and cook everything for only a few minutes, then add stock or crushed cubes and add 500ml of water bringing everything to a gentle simmer. Cover (if you don’t have the lid, use tin foil) and place it in the oven for 2 hours. About 30 minutes before your casserole is ready, prepare potato and celery mash. Peel potatoes and celery root and cut them into about 1cm cubes. Boil them in salted water and when they are soft and ready, drain and leave them to steam dry for a couple of minutes. Mash them with freshly ground black pepper, milk and butter. Adjust seasoning if necessary. When the casserole is ready and out of the oven, leave it to sit for about 10-15 minutes. Serve with a dollop or two of mash and sprinkle with fresh parsley or coriander. Pour yourself a glass of favourite drink and dig in! This cake was discovered by my mum and it is awesome! I took over the recipe and slightly modified it to make it lighter but it is still (oh yes, it is!) a chocolate cake. I’m sharing it with you because I’m a selfless person who believes that chocolate cake is like a little black dress – a classic that everyone loves. Also, because I want you to mention me every time you talk about this cake. It is a 30-minute sweet venture and your friends will be asking for the recipe like it’s nobody’s business. Combine both flowers, sugar, cocoa powder, bicarbonate of soda and mix well. Add oil and yoghurt to dry ingredients and whisk until well combined. Pour the mixture into a well-greased 9×13 baking pan, sprinkled with a little bit of flour and bake it in a preheated oven at 200C (390F) degrees for 25 minutes. Start checking after 20 minutes, the cake should be soft but not wobbly. When the cake is ready, take it out of the oven, pierce it with a fork or a knife in two dozen places and pour the hot glaze over it. Leave it to cool for a couple of hours, ideally. In our house, the cooling time varies between 15 minutes and 2 hours depending on how long the kids (read: I) can wait. Serve with vanilla ice cream or cream topping. Let me know how much you like it (wink).